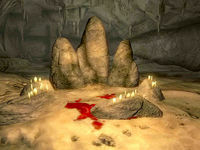 Barren Cave is a small cave west of Cheydinhal containing vampires. It contains only one zone, Barren Cave. This cave contains 19 Wisp Stalk plants. Barren Cave also appears in ESO. 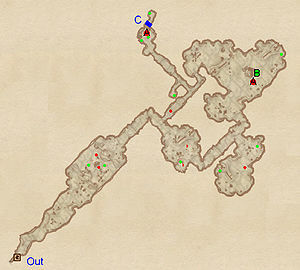 This location's map marker (M on map) is named Barren Cave (editor name BarrenCaveMapMarker). The entrance door is ENE of the marker, 70 feet away. This cave is rich in treasure and is fairly small, so is definitely worth exploring, even if it means contracting Porphyric Hemophilia from one of the Vampire inhabitants. Upon entering from door Out, proceed forward to a large room with a pit, six coffins arranged in a circle and two vampires. Dispose of the vampires and search the coffins for valuables, then proceed forward to an intersection. 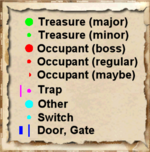 Both directions will land you in the same area, so take care of the patrolling vampires and be on the lookout for minor loot chests (green dots on map) as you fight your way through to the large northeastern room for an encounter with a boss-leveled vampire at A. Loot his boss coffin near the shrine at B, then make sure to slay the other boss-leveled vampire at A in the northernmost room and claim your reward from the coffin and the locked chest. 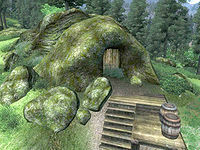 Remember to approach the large rock (C) in the northern end of the room, which will reveal a hidden path to another chest. When all is said and done, exit Barren Cave the way you came.